Vyntec Carbon reinforced polymers are advanced composites that can outperform metals and specialty engineering thermoplastics. Developed to provide an easily mouldable, cost efficient, lightweight material for demanding applications in aggressive environments, Vyntec short-carbon fibre reinforced composite delivers an unmatched balance of mechanical and tribological properties. 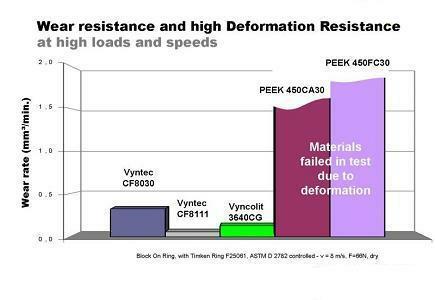 Vyntec CF8030 – superior mechanical properties including high tensile and flexural strength and modulus combined with low density. Vyntec CF8131 – superior tribological properties.